Safyre is a registered AQHA appendix mare. She was born in 2008 and is currently 15.2 hands. She has been colored tested by U.C. Davis as EE AA nZ. Her sire was Champs Guthrie, a brown silver AQHA & NFQHA stallion. Her dam is Rockville Centre, a brown JC Thoroughbred mare. In 2011 Safyre was presented to ISR/Oldenburg N.A. for breeding approval. She earned a 102 point score and is entered in the Mare Book since she is 58.5% Thoroughbred. In 2012 Safyre had her 1st foal. Sachi, a filly by Sir Gregory, was born in May and presented it ISR/Oldenbirg in August for registration. 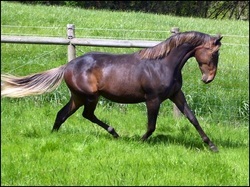 She was received a Premium Foal Award & was also the Site Champion.